There is something about a two-week break from school that, once the initial refreshment has worked through the system (takes about 5 days), ideas and creativity flow like saturated aquifers (topical – we’ve had a ‘spring’ running through the village all week as the hills round here leak out their accumulated rain from England’s wettest year on record). I’ve read so many insightful, imaginative and deeply considered blogs over the past 10 days or so that I feel the need for a place to organise, classify and maintain them somewhere to return to on a regular basis. So this post is as much about me finding a library system as much as anything else. The theme that many of them adhere to is found in the school structure model that is usually presented. That irregular pyramid of responsibility that emits alluring scents of differential salaries, timetables, status, responsibility, pressure and – accountability. It’s the pyramid that many of us intend to climb or rise up, a greasy-pole to be overcome or a promotion ladder to be stepped up. The language is all about ascent, getting to the top, being above where you were and defying gravity. It’s imagery that necessitates strength, robustness and a rising of the cans from the can’ts. I’m always surprised that ‘Students’ don’t make an appearance in most structural hierarchies. At least this industrial pyramid acknowledges the end-recipient, though I don’t know if we’d use the same term in education. (pause….reflects). Not sure ‘all’ of us would use that term. However, if you look at their website here the listing of the key personnel suggests they haven’t worked the significance of the inverted structure into their thinking to any great extent. It looks like a PR flip rather than flipping the thinking. So what are the implications of an inverted pyramid school structure? There will be others that I’ve missed – please consider sending me links to similar-type posts I can add to this ‘library’. But if the way we perceive an organisation influences how those within it go about its daily business, inverting school organisation models could be a ‘tweak to the environment’ that Shapes a new Path with minimum investment compared to possible benefits. 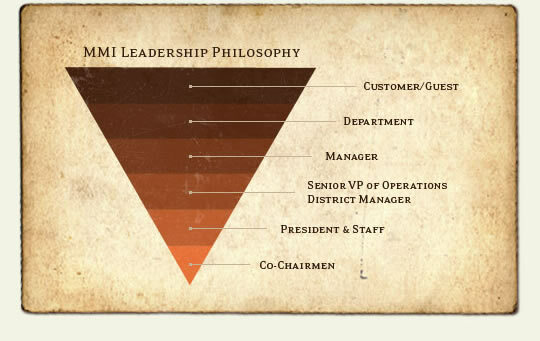 Will current school leaders publish an inverted pyramid structure? Not sure. Will some of those not in headship roles – who may be there in the next few years choose to present their first school organisation structure as an inverted pyramid – and breathe life into its implications? Perhaps in doing so they would be making their core purpose stand on its head.